The guests at the WorMotel check in with a plop. Each guest has a private room, cozy and controlled temperatures, and enough food to last a lifetime. There’s just one catch: They can never leave. 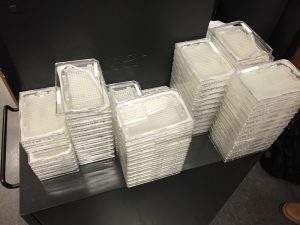 The WorMotel, a silicone plate with an array of 240 wells that host the roundworm C. elegans, is the creation of researchers at University of Pennsylvania’s Fang-Yen Laboratory. They create the silicone rubber “motels” from a mold, add a splash of bacteria to each “room,” then a machine automatically drops in the guest of honor—a single nematode. Multiple motels are stacked in a carousel, allowing researchers to study thousands of the worms at a time. Stacks of silicone WorMotels awaiting residents. Credit: University of Pennsylvania. Churgin worked with Christopher Fang-Yen of the Fang-Yen Laboratory to study the nematodes, and their work was recently published in the journal eLife. But why study these worms in the first place? And what can an organism that’s just a millimeter long, lives for a matter of weeks, and contains only 1,000 cells tell us about humans? Nematodes are a popular model organism to study human aging and longevity, explains Churgin. In fact, that’s the ultimate goal of WorMotel. That’s built into the WorMotel’s design. The bacteria that serves as their food can be engineered to turn off a single, specific gene in each worm, allowing researchers to study how the absence of that gene affects an animal’s lifespan and health as it ages. And hey, life could be worse for the nematodes, too. Using meticulously crafted platforms, patterns, and layers, Edmark's art explores the seemingly magical properties that are present in spiral geometries. Every day at the Sims Municipal Recycling facility in Sunset Park, Brooklyn, roughly 800 tons of recyclables meander through a tangle of machines, scanners, and conveyor belts.